The leopard is without a doubt the most beautiful and most elusive member of the Big Five. It’s the most sought after sighting amongst tourists and one that safari guides across Africa spend their days in search of. If you are lucky enough to see a leopard in your life… that moment will be one that you remember and treasure forever. Leopards are solitary and stealthy predators whose mastery of camouflage makes them very difficult to spot. To increase your chance of seeing them you need to find their prime habitats where concentrations are greatest. It also really helps if guides are able to take you on night drives as well as drive off road in the reserve to follow these magnificent predators. A leopard sighting is truly a sight to behold but unfortunately seeing them really is down to luck. However, if you go to one of the 5 places listed below you will most definitely have better odds of witnessing this definitive wildlife experience. The Sabi Sands situated on the Kruger National Park’s western boundary has an incredibly high concentration of leopard. Within the Sabi Sands your best bet is most definitely Londolozi as this pinnacle safari destination prides itself in its incredible relationship with its leopards. The reserve contains hoards of the perfect leopard prey, its lush habitat and expanse of dense trees makes is perfect for leopards and guides are allowed to drive off road and at night in search of them. Click here to read our five favorite stories from the famous Londolozi blog. Moremi is a truly special place as it surrounds much of the Okavango Delta, Botswana’s wildlife hotspot. With herds of small antelope, monkeys, warthogs and the like the grassy floodplains and tall forest are prime leopard country. Most of the camps allow night and off-road driving which helps considerably too. Chiefs Camp in particular sits on the Delta’s largest island and is renowned for some of the best big game viewing in all of Africa and most notably leopard viewing. The Samburu and Masai Mara National Reserves both have great reputations for excellent leopard sightings. Samburu a dry woodland area and the Mara an open rolling grassland are both prime leopard habitats. Leopards lie especially along the rivers, in the trees and in amongst the kopjes awaiting the arrival of their prey often which consist of the great herds that move annually into the areas. The exquisite South Luangwa Valley in central Zambia boasts one of the highest concentrations of leopard in Africa due to its high concentrations of prey. A wide and fertile alluvial plain nourished by the Luangwa River, the park’s wildlife ranges from aardvark to zebra and it has long been known for its dense concentrations of predators, especially lions and leopards. South Luangwa camps also offer some of Africa’s best walking safaris, which enable you to prowl this big predator country on foot! The Kalahari Desert is a large “waterless” desert covering most of Botswana, Namibia and South Africa. 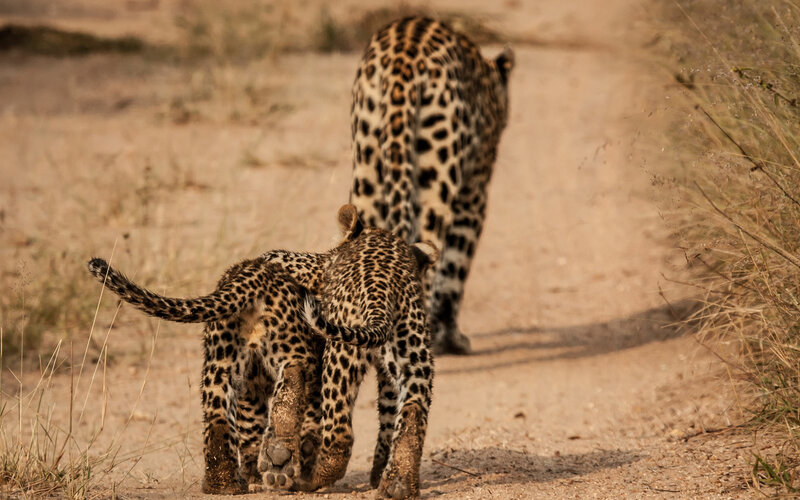 It is hot and rainfall is minimal but it is also home to a large collection of leopard, which graze and cool off by the few rivers in amongst the sandy plains, mostly up North towards Namibia. A leopard sighting is one of life’s true wonders, an experience you will never forget and one that will leave you speechless and covered (head to toe) in goosebumps! We wish you all the best on your quest to get up close and personal with Africa’s most magnificent predator.